Tumalo Falls is not all that close to the town of Tumalo or Tumalo State Park. For those of us coming from the Redmond area, it feels deceptively far because you’re not just popping over to Tumalo. You have to go through Bend to reach it. 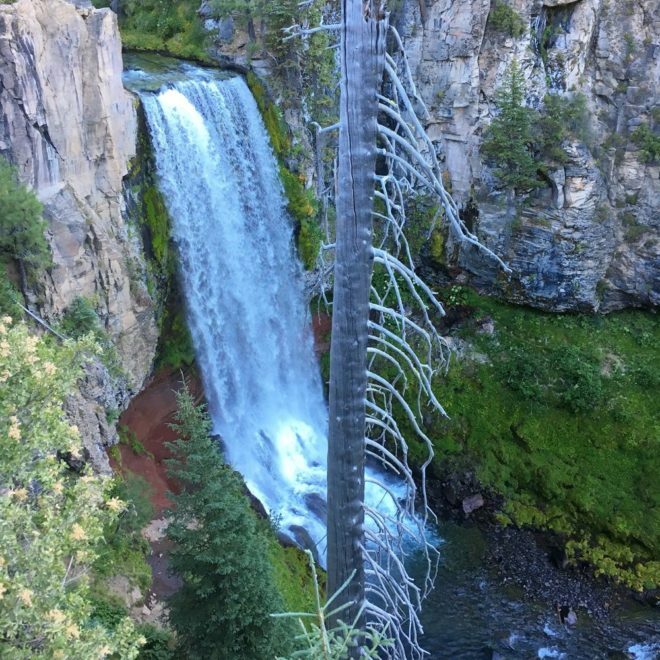 The main hike doesn’t end at Tumalo Falls – it starts there. Tumalo Falls is actually visible from the trailhead parking lot. And the trail continues along Tumalo Creek toward a half dozen other waterfalls. You have a few different hiking options at this spot. 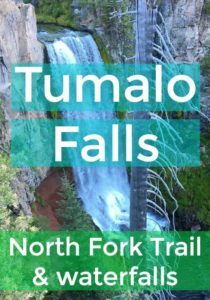 They range from walking a few yards out of the parking lot to see Tumalo Falls, hiking to the top of the first falls (about half a mile round trip), hiking out and back on the North Fork trail (the most scenic option, 4 – 6 miles), or completing a loop of 7.2 miles. Mountain bikers also frequent the North Fork Trail, so keep an eye out. Bicycles can only go one way on the trail. Dogs are not allowed on some sections of the trail. 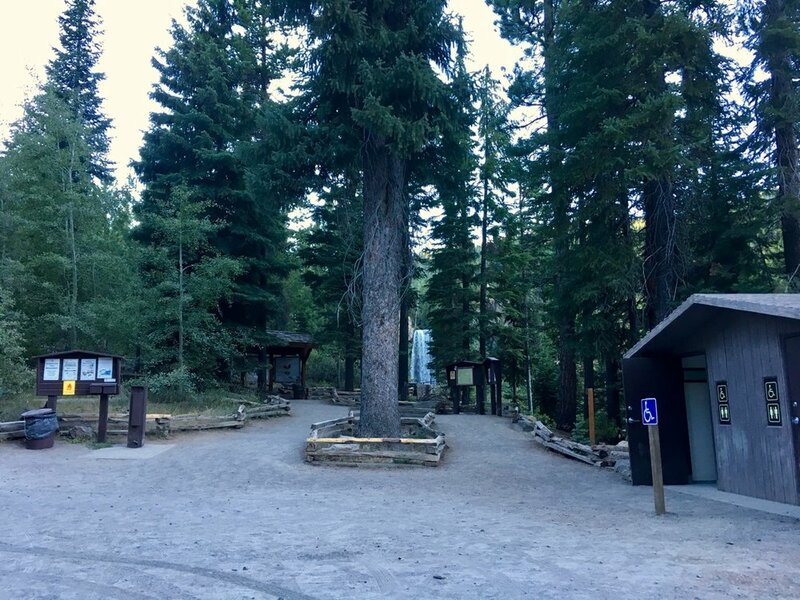 A National Forest Service pass or $5 day use fee is required to access the park. Drive West from Bend on Skyliner’s Road into the Deschutes National Forest. This becomes Forest Service Road 4601. 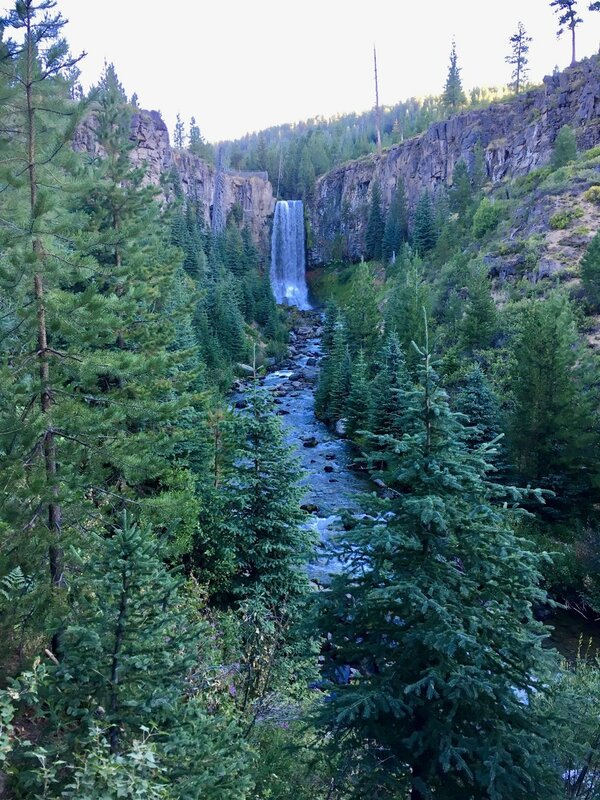 After passing a small forested neighborhood and sign for Skyliner’s Lodge, you’ll see a sign to turn left for Tumalo Falls. 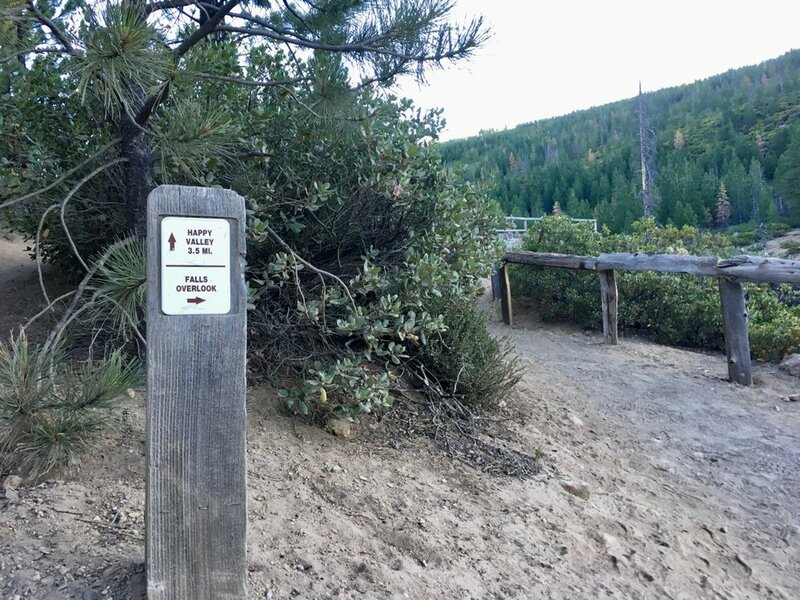 Follow this gravel road for about 2.5 miles to the Tumalo Falls trailhead, which has pit toilets, map, fee station, and a great view of the falls. At 7 a.m. on a Saturday in August, we were the first vehicle in the parking lot. 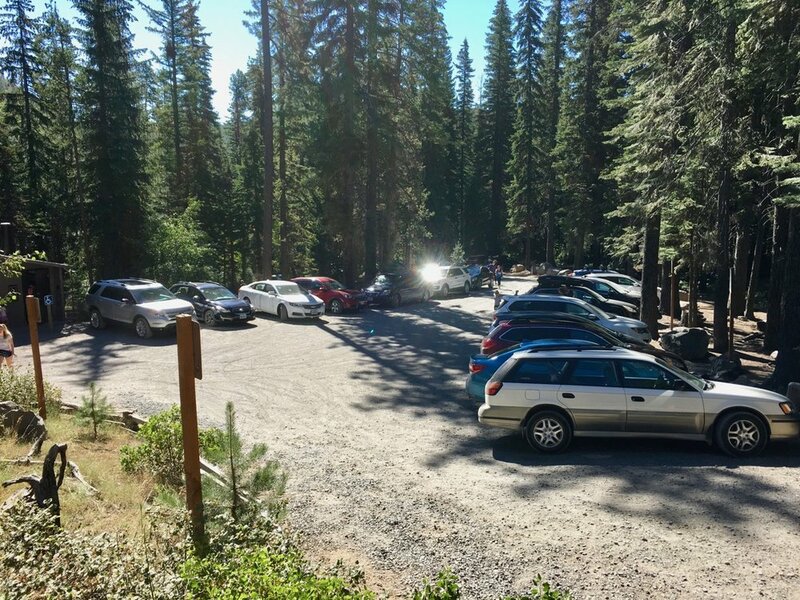 By the time we retuned at 9:45 a.m., the lot was full and cars were parking in nearby pull offs along the road. While you have an unobstructed view of the falls just steps away from the parking lot, it’s worth the short hike to get a different perspective. The North Fork Trail begins on the left as you walk from the parking lot, after the fee station. It’s a relatively wide dirt trail that goes steadily uphill. This first section may the steepest part of the whole trail – but it’s not too strenuous. The reward is another perspective of the waterfall, including a viewpoint from the top looking down the cascade. If you don’t have a Forest Service pass (annual passes, senior National Parks pass, etc. count), be sure to bring $5 cash. Take an envelope from the fee station box, fill it out with your vehicle info, hang the tab from your rearview mirror, and stuff the envelope with $5 into the slot. 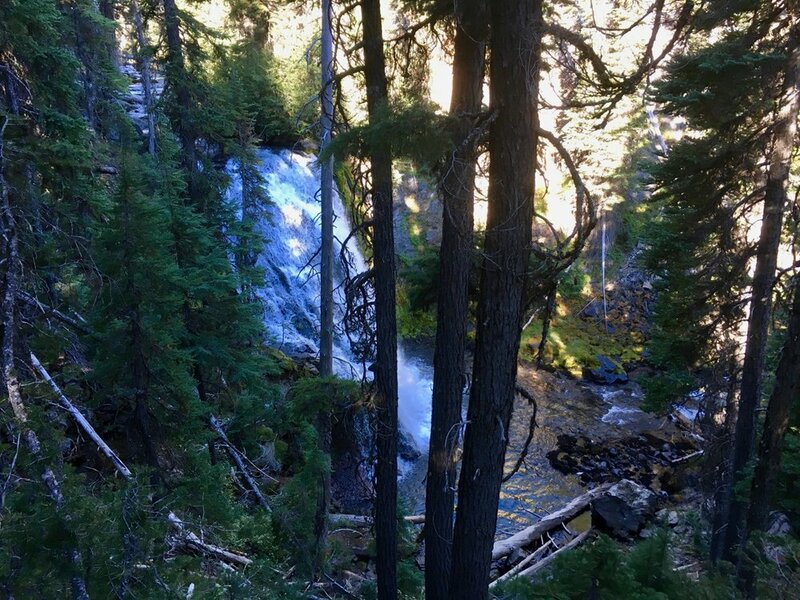 For hikers who continue past Tumalo Falls, you’ll be rewarded with more and more waterfalls. The dirt trail narrows a little bit and continues gradually uphill along the creek. 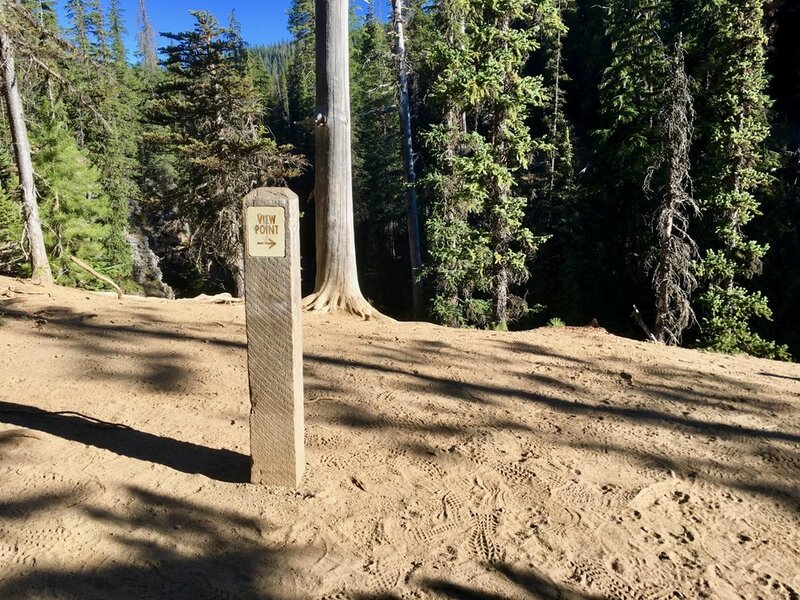 Around one mile from the trailhead (roughly half an hour hiking), you’ll come to the first viewpoint sign. Apparently this is called Double Falls. Hold on to any small children as there is no railing and a very steep cliff below. Around the second mile (about an hour walk), there’s another viewpoint sign and a fourth waterfall that’s partially obstructed in the forest. 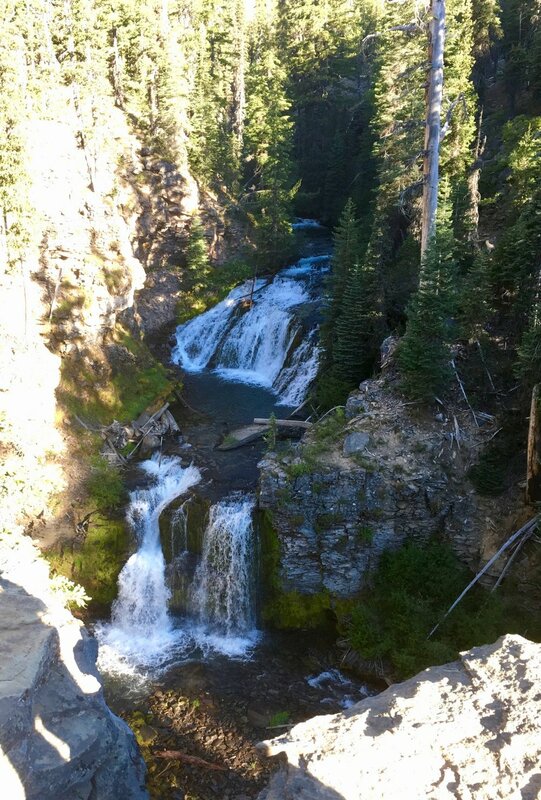 This is apparently referred to as Middle Tumalo Falls as well as the Upper Falls. You may wish to turn around here for a 4 mile hike. 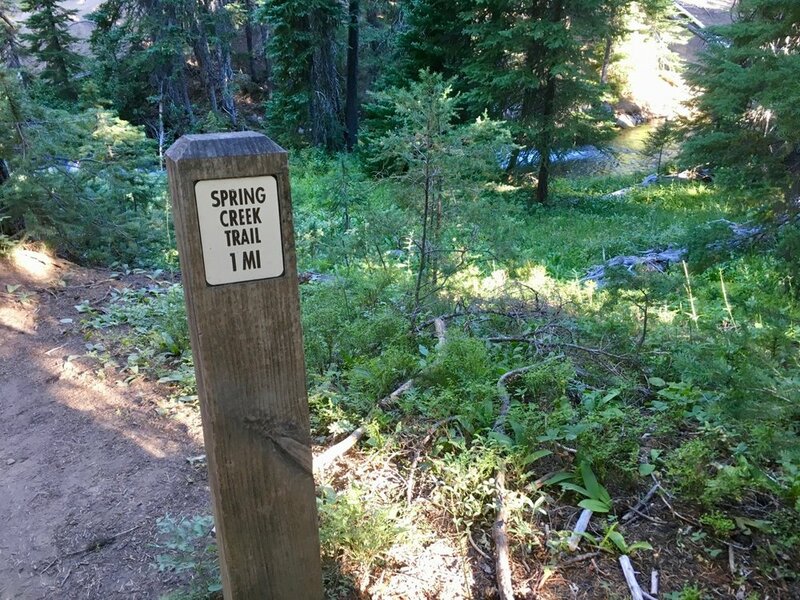 A sign for Spring Creek Trail is nearly 2.5 miles from the trailhead (the sign says it’s 2 miles from Tumalo Falls). It indicates that the Spring Creek Trail is one mile away. Almost immediately after the sign is a small log bridge to cross the creek. This is where we turned around, making our hike about 5 miles, 2.5 hours (with breaks at each waterfall). 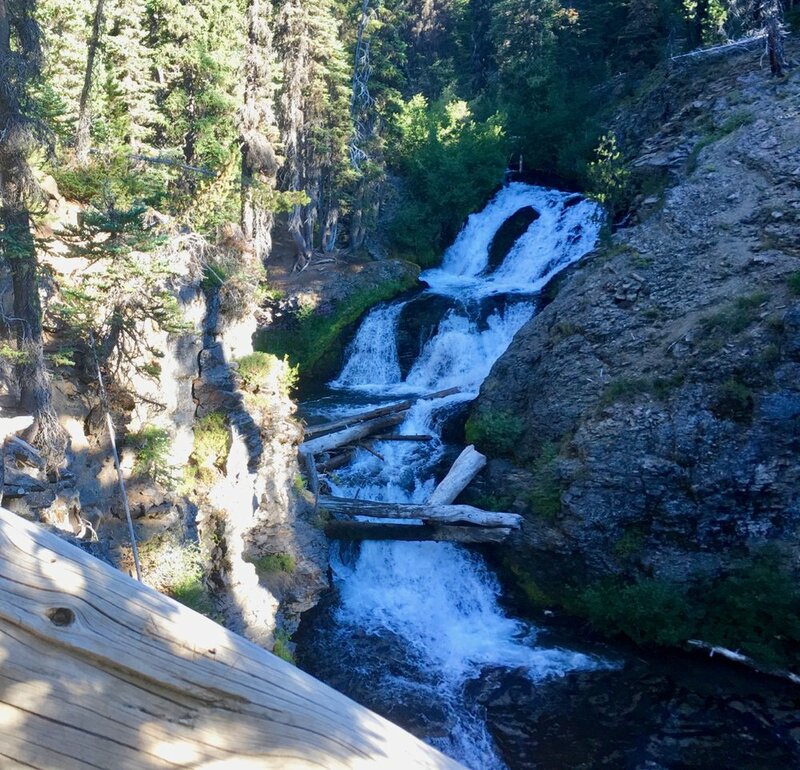 You could also add that additional mile and turn around at the Swampy Lakes Trail intersection instead, for a longer out-and-back hike with a couple more waterfalls to boot. To see all 8 – 10 waterfalls (reports vary), try the full loop. 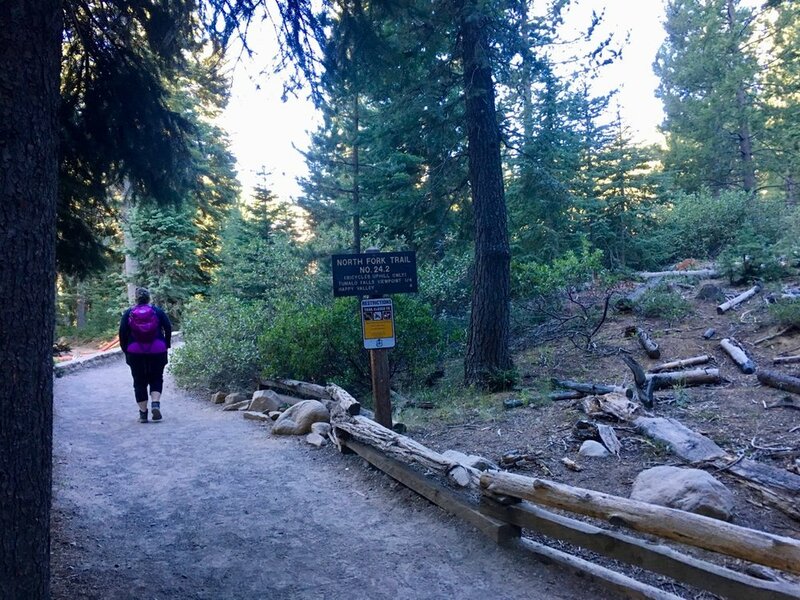 After reading multiple blogs and reviews saying the second half of the loop was not very scenic and that the loop requires fording the creek (and that there were more mosquitos), we took everyone’s recommendation to just do an out-and-back hike. However, if you’re in it for the mileage, or just want to see something different, head back via Bridge Creek. After hiking 3.6 miles up the North Fork Trail, you’ll come to a junction with Swampy Lakes/Spring Creek. To the right is a trail to a meadow called Happy Valley. To the left is the Swampy Lakes trail which will loop you back to the Tumalo Falls Day Use area. Around here, you’ll reach the peak of the trail – 1,100 feet above where you started. When the trail leads back to the creek, you will need to either wade through the water or find a downed log to cross. Continue via the trail on the other side, heading down hill. This half of the loop has less tree cover, which affords some nice views but also exposes you to the sun much more than the first half. 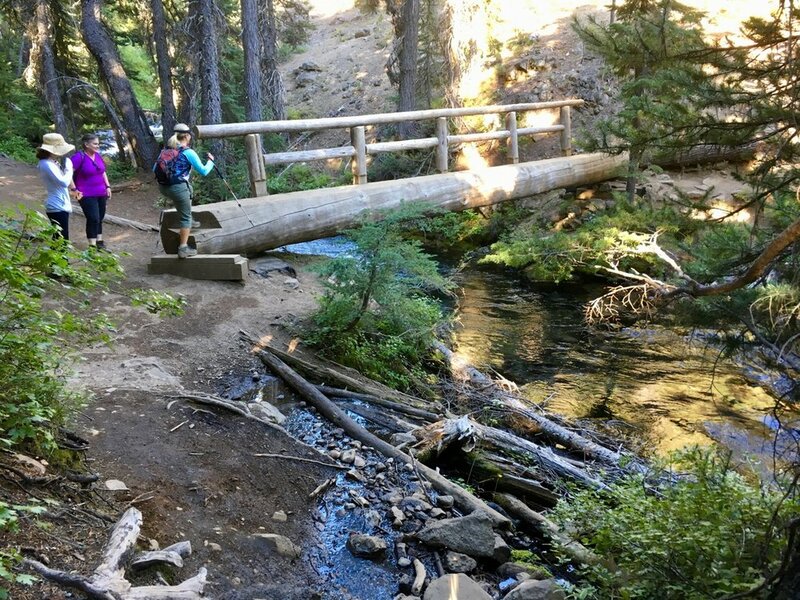 Turn left for the Bridge Creek Trail and follow it past the viewpoint of Bridge Creek Falls, then a final right to return to the Tumalo Falls Day Use area. Pin this post or share with friends! This hike looks spectacular! Great photos! Thanks for the clear details on how to do this hike! The waterfall is so beautiful! Thanks. It’s definitely worth a visit!